We hope you can visit the exhibition, but if not you can visit the Meaning Maker website and download all of the Meaning Maker editions to experience in the privacy of your own home. This is an amazing project curated by Beau Beausoleil and Sarah Bodman. 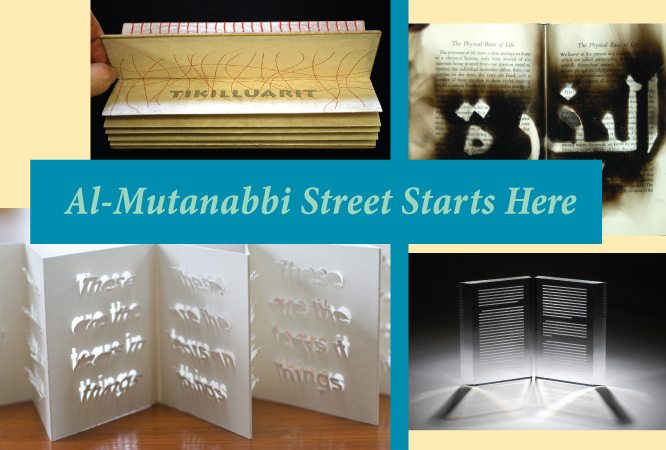 It involves 260+ artists and their responses to the bombing of Al-Mutanabbi Street, a historic location for booksellers, tea houses and the heart and soul of the Baghdad literary and intellectual community, in 2007. Nanette will be exhibiting a new augmented reality project, In Other Words, commissioned by TheatreWorks for their New Works Festival at Lucie Stern Theatre in Palo Alto, California, Aug. 10 – 18. Nanette also co-curated a small exhibition of interactive online works in the Digital Humanities with festival director Tom Bruett. More information is at the festival website. Both Kent and Nanette are included in the upcoming 500 Handmade Books, Volume Two, Published by Lark Books and curated by Julie Chen. This book is due to be available in September. Nanette’s online project: haikU is published in the Rio Grande Review Digital Edition, University of Texas at El Paso. Editors: Scott Rettberg, Leonardo Flores and Juan Pablo Plata. Experience the Rio Grande Review. In June, the Earth • Science • Art exhibition curated by Lisa Hochstein last year traveled to USGS headquarters in Reston, Virginia. We are developing a web presence and network for Bay Area printmakers and print studios. We will provide you more info on this later. For now: Please email us contact information for Bay Area print artists and studios. This entry was posted in July, 2013 and is filed under Exhibition, News.